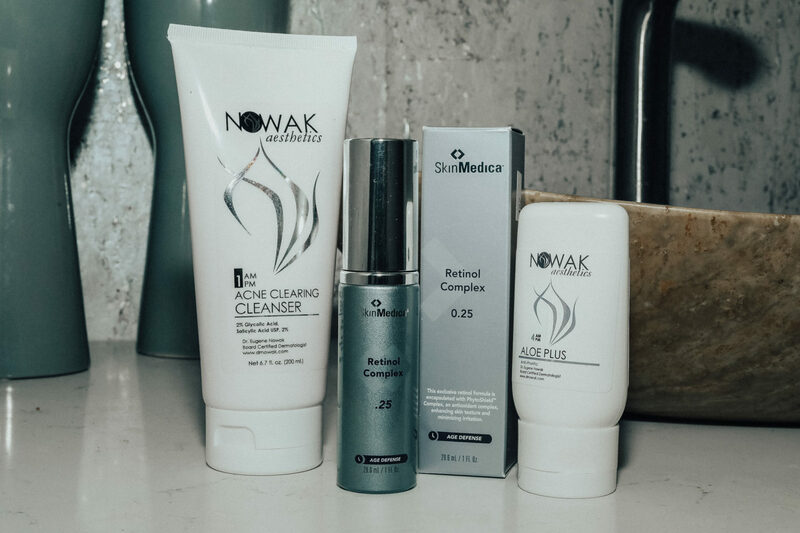 Ever feel like you don’t know where to start when it comes to your skin? I’m right there with you. Many of you might not know this, but I grew up having acne — nothing to be ashamed about just genes. In my teen years, I was so used to going to the dermatologist, it was at least twice a month. However, as I grew older, my skin started clearing up and I lost touch with that part of my beauty maintenance. Recently, I decided that I should get my skin checked out for preventative causes rather than something being apparently wrong. 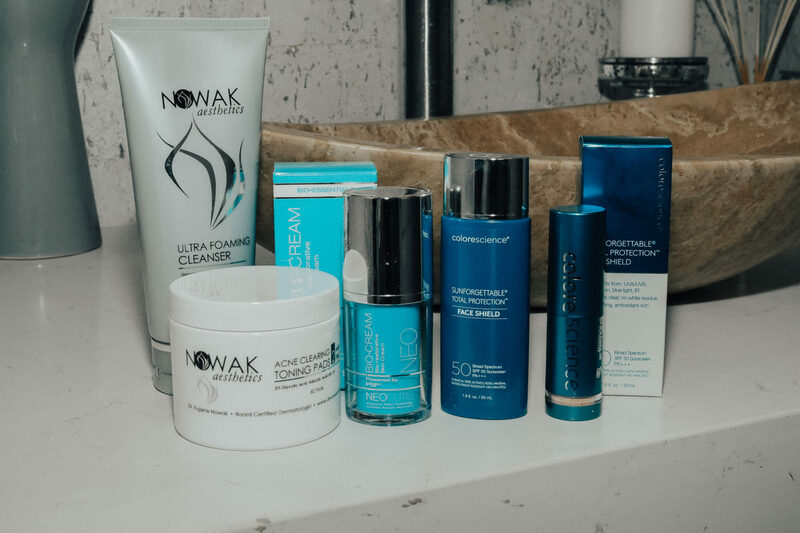 Many of you read over my amazing cool sculpting experience with Nowak Aesthetics. Their staff was so inviting and helpful I decided to go back to do a little research on my skin type and how I could start taking care of it for years to come. I decided to have my skin checked out — and you guys they were not playing around! They scanned my face with VISIA, which is a skin assessment report.  Basically, pictures of your entire face are captured to determine spots, wrinkles, texture, pores, UV spots, brown spots, & red areas. Talk about a thorough assessment! Each area gives a percentage and you want to be in the high percentile — just like school. The picture below is an example of the analysis through VISIA. 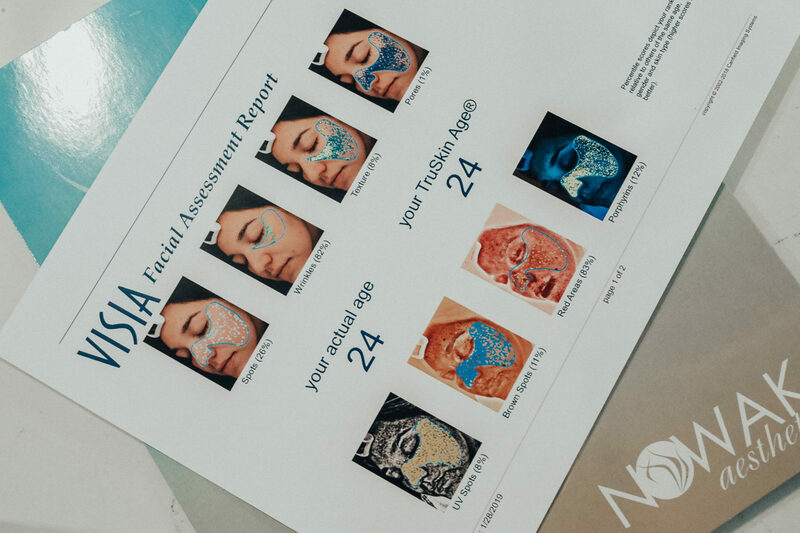 I found out that I needed so many areas of improvement, but I was so happy that I got it checked out because that way I could improve my skin and create a skin regimen based on the analysis. You all know the amount of products that I get in the mail. I try all of them out, give my honest feedback, and most of them are wonderful— however, the vast majority of these products are for the masses. This means, nothing personalized for yourself or your skin. 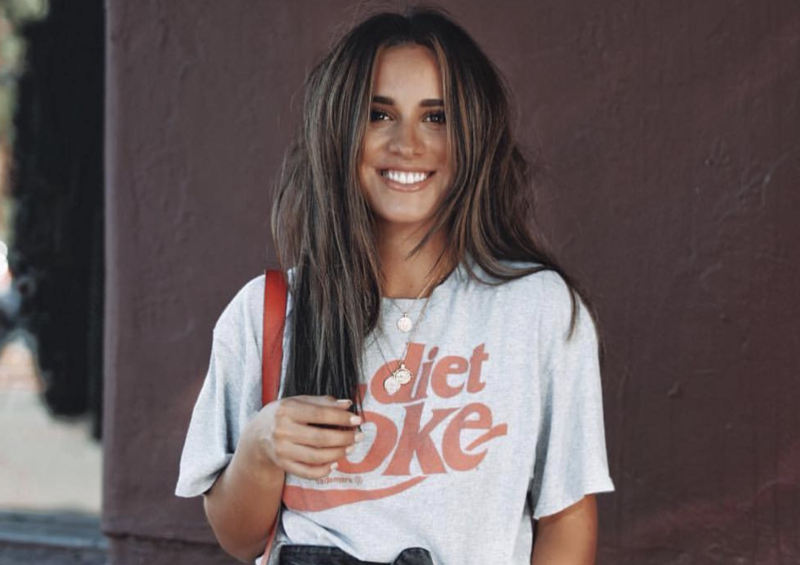 But don’t get too detached to those products — If you absolutely love a serum, face cream, toner — or whatever it is– your dermatologist will find a way to work it into your skin care regimen. It’s all about a balance and what works best for you! Now on to the good stuff — the actual products. I found that skin care is not only important at night, but also in the morning! Is anyone else surprised, or is it just me? Below are all the products that were recommended for use. They seem like a lot, but it’s actually super simple and my face is already starting to feel so much better. The morning routine is a little more complicated than the night routine, but if you think about it, it’s super necessary. The first step is a cleanser to wash your face with a foaming texture — this one specifically has Vitamin A,C, and E which aids in the restoration of healthy looking skin. Afterwards, I use the acne clearing toning pads — this is more of a specific treatment because of my analysis but they are for acne treatment. I then apply bio-restorative cream for aid in post-procedure to the acne pads (which can dry out skin) and then I use the Sunforgettable SPF (so important, plus UV Spots was one of the areas that I scored the lowest on). I’ve noticed that I feel much more comfortable in my skin wearing up-dos and limiting my amount of makeup. 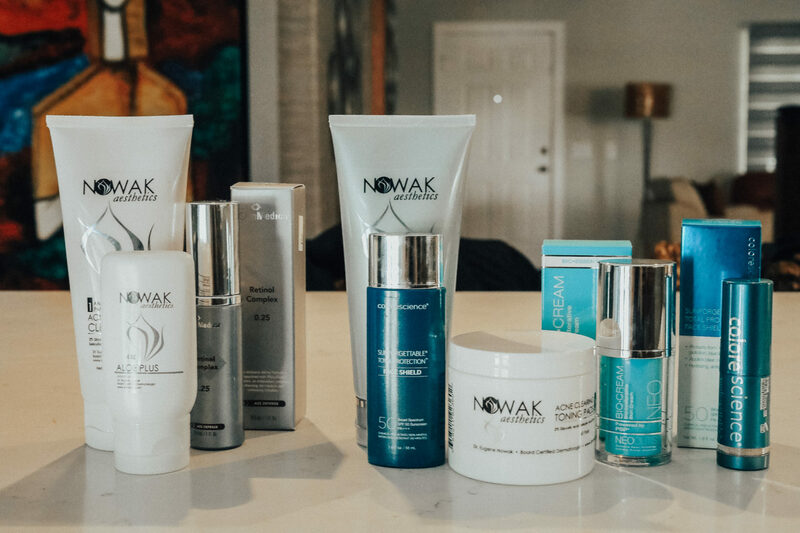 If you live in the San Diego area, I highly recommend that you at least have a consultation at Nowak Aesthetics. If you do not, make sure to get informed. Either way, all their products are available online. Make sure to take care of your skin, you never know what you might find out! If you want to take it a little further and get a facial — I recommend a deep cleansing facial. It is not the relaxing kind of facial especially if you have some problem areas, but it will definitely remove all the impurities living in your skin (even ones you didn’t know were there). I’m not kidding, I didn’t even know I had blackheads and apparently I had comedones which apparently are plugs of oil and dead skin. It sounds gross but imagine knowing that they are taking all that out from your skin, so satisfying. I had my facial procedure done by Conchita at Dr. Nowak’s office and she just has such a zest for life. She explained everything that she was applying and even started up casual conversation which took my mind off the tolerable pain that I was feeling. Like I said, their staff are all gems. Check out their many facials here! I’ve stayed true to my anti-aging serum by Estee-Lauder and what I love about my new skin regime is that I can still use this product or my hydro city shield from Neutrogena as well. I can still layer on the products I use, but according to my skin type and what works best for my skin. I have so many new projects to come regarding skin care — some even include my mami (with before & after pictures!! ) Stay tuned and make sure to get that skin checked out, it may not be a priority now, but eventually you’ll knock yourself for not starting young! 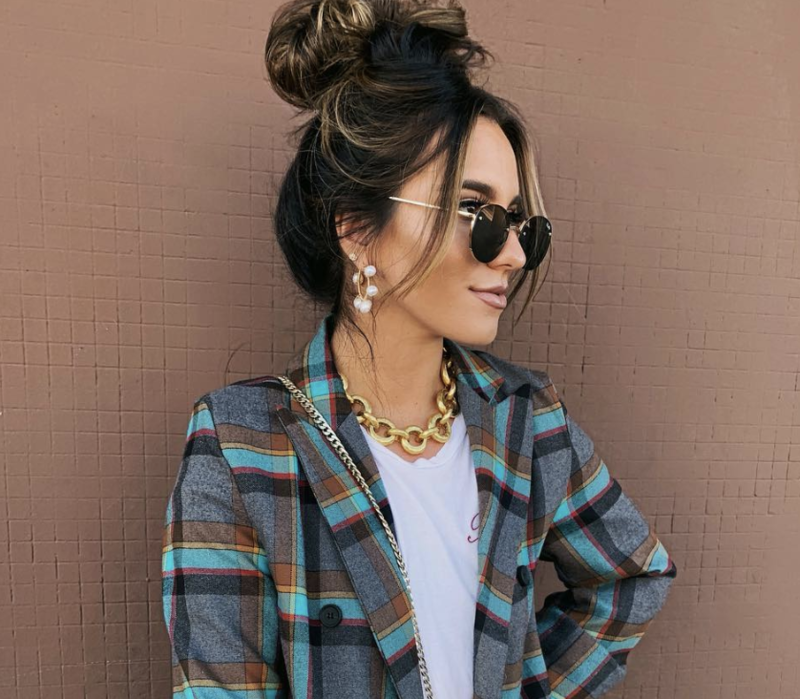 Previous Post Tips for a messier hair-bun.